Bruno Liljefors (1860–1939), Geese in Wetlands (1921), oil on canvas, 60 × 100 cm, Private collection. Wikimedia Commons. During the 1880s, Bruno Liljefors (1860–1939) excelled as a wildlife artist, and was appointed head of the art school in Gothenburg, Sweden, in succession to Carl Larsson. But his personal life was in turmoil, and the 1890s were barren years when he often ran short of money. 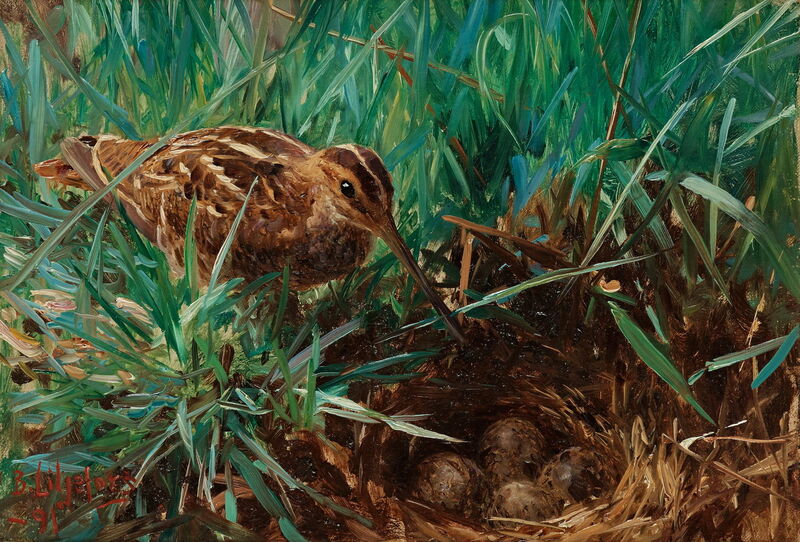 Bruno Liljefors (1860–1939), Common Snipe at its Nest (1891), oil on canvas, 25.5 × 35.5 cm, Private collection. Wikimedia Commons. His Common Snipe at its Nest from 1891 is a fine painting, but lacks the brilliance of his earlier work, with its loose backgrounds inspired by the work of Jules Bastien-Lepage. 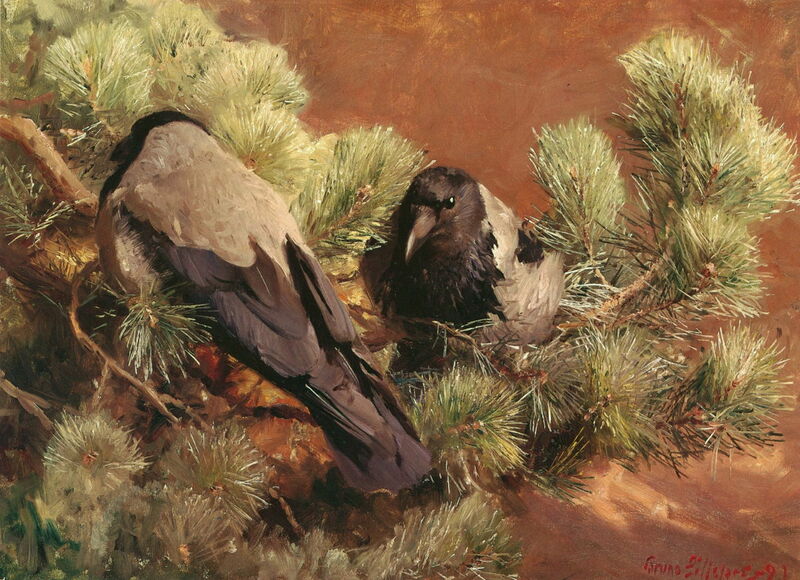 Bruno Liljefors (1860–1939), Hooded Crows (1891), oil on canvas, 52 × 70 cm, Gothenburg Art Museum, Gothenburg, Sweden. Wikimedia Commons. Hooded Crows (1891) captures these northern members of the crow family well, though. 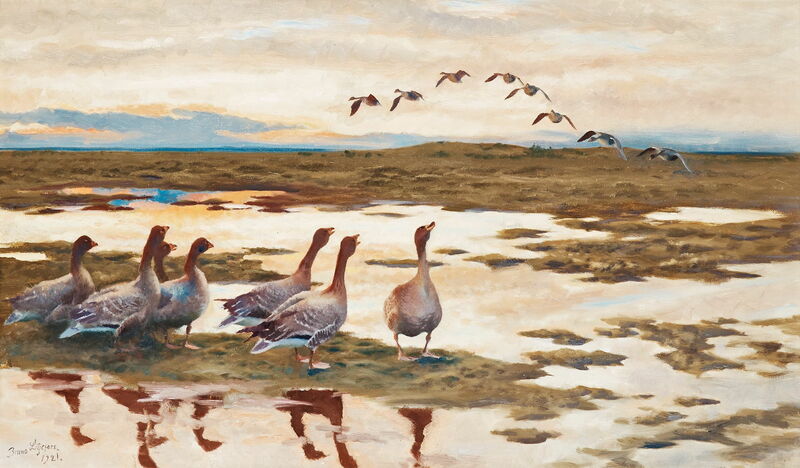 Bruno Liljefors (1860–1939), Hunting Geese (1896), oil on canvas, 61 × 137 cm, location not known. Wikimedia Commons. Some of his finest paintings from this period are almost pure landscapes, such as his Hunting Geese (1896) with its superb mackerel sky. 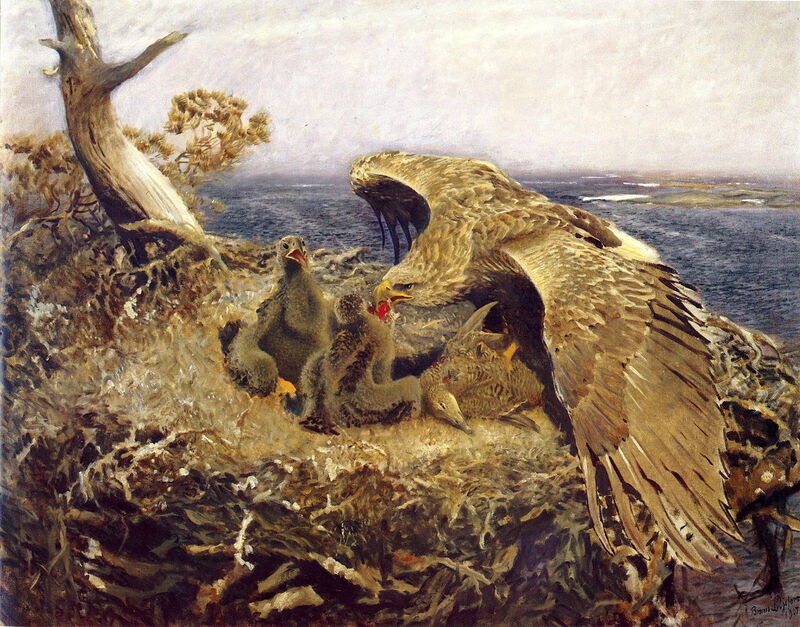 Bruno Liljefors (1860–1939), Sea Eagle’s Nest (1907), oil on canvas, 200 × 180 cm, Nationalmuseum, Stockholm, Sweden. Wikimedia Commons. He seems to have recovered his earlier form in the early twentieth century, as his new family grew around him. Spectacular paintings such as this Sea Eagle’s Nest from 1907 were often set around the fragmented coast of the Baltic. Although photographic technology was advancing rapidly, wildlife photography was still in its infancy: for instance, the National Geographic magazine published its first monochrome wildlife photos in 1906. Bruno Liljefors (1860–1939), Winter Hare (1910), oil on canvas, 92 × 78 cm, Private collection. Wikimedia Commons. 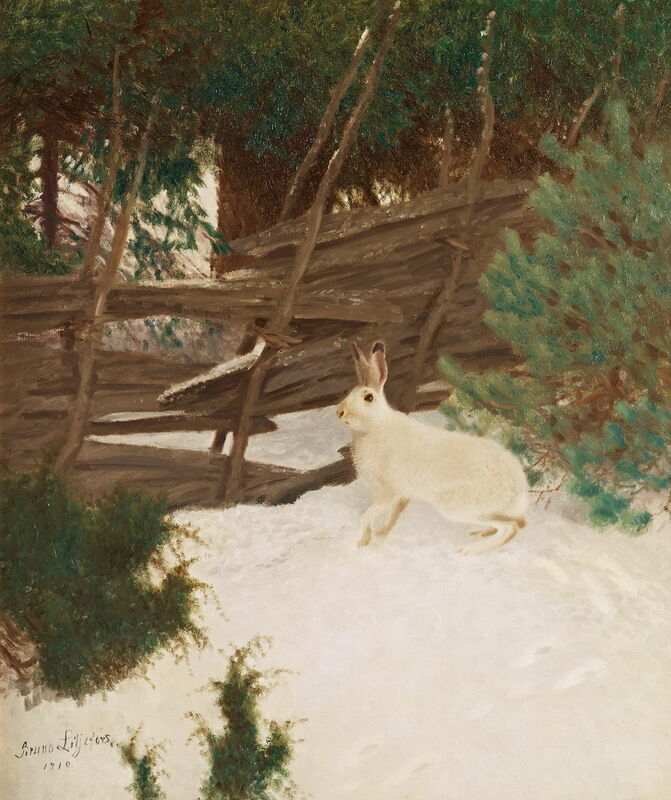 This is one of the many paintings that Liljefors made of a Winter Hare, here from 1910. Bruno Liljefors (1860–1939), Long-tailed Ducks in the Outer Archipelago (1911), oil on canvas, 65 × 136 cm, location not known. Wikimedia Commons. His later works include some substantial groups of birds, such as these Long-tailed Ducks in the Outer Archipelago (1911). Bruno Liljefors (1860–1939), Portrait of Zorn (c 1916), oil on canvas, 65 × 55 cm, Private collection. Wikimedia Commons. When Liljefors painted this Portrait of Zorn, in about 1916, his subject was in his mid fifties, the same age as the artist. Liljefors seems to have benefited from the long days and nights that he spent out in the country. Anders Zorn died four years later, at the age of only 60. In 1917, Liljefors moved his studio to the village of Österbybruk near Uppsala, but continued to work from hunting lodges when necessary. 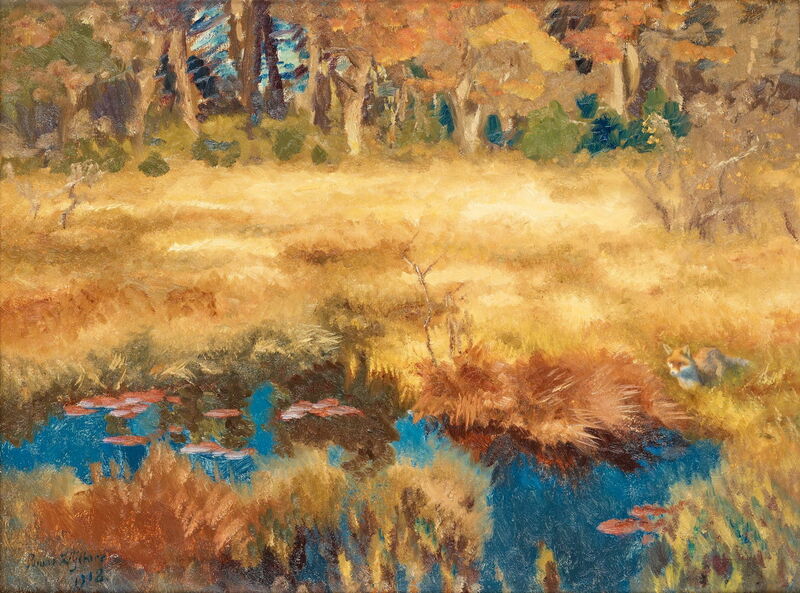 Some of his landscapes became more post-Impressionist, as seen in this Autumn Landscape with Fox (1918). 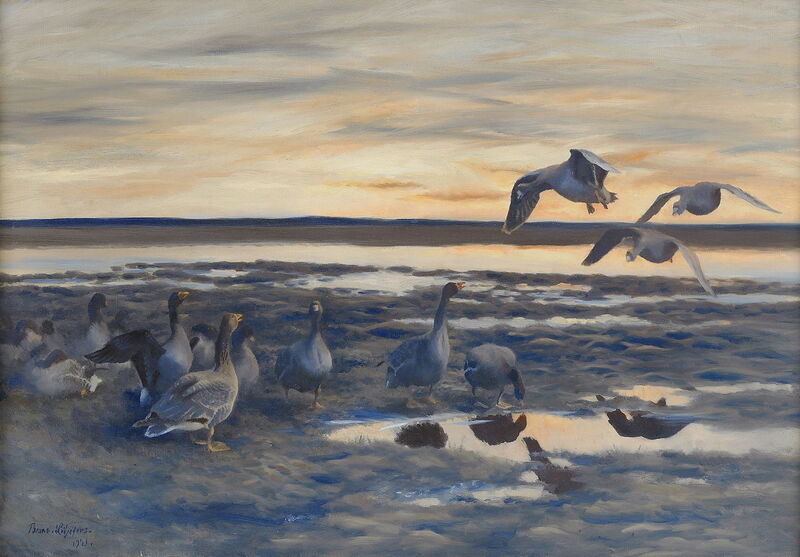 Bruno Liljefors (1860–1939), Bean Geese Landing (1921), oil on canvas, 70 × 100 cm, location not known. Wikimedia Commons. His dedicated wildlife works didn’t weaken, as he concentrated on coastal wetlands, as in these Bean Geese Landing (1921). Some of these late paintings have wonderful dialogues between the sky and water, as in these Geese in Wetlands (1921). 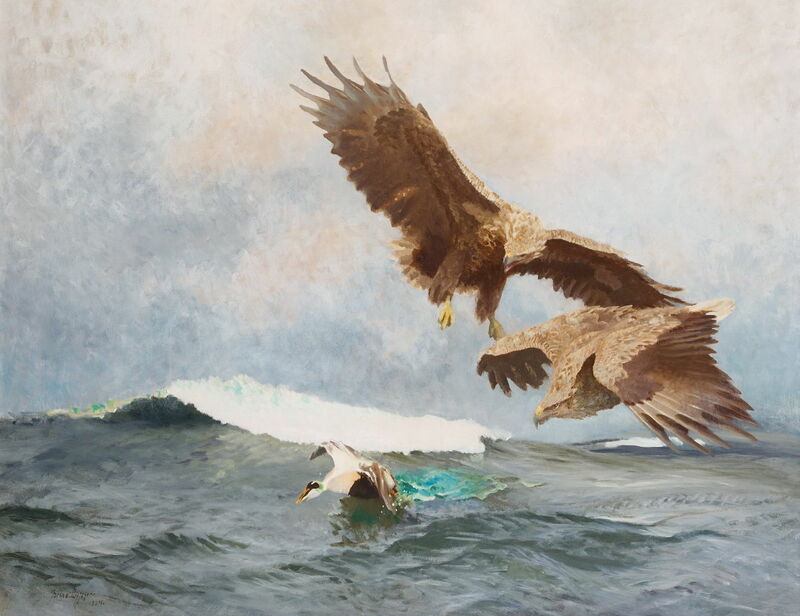 Bruno Liljefors (1860–1939), Sea Eagles Chasing an Eider (1924), oil on canvas, 125 × 160 cm, location not known. Wikimedia Commons. Liljefors never lost his fascination for the relationship between predators and prey, as seen in his Sea Eagles Chasing an Eider from 1924. 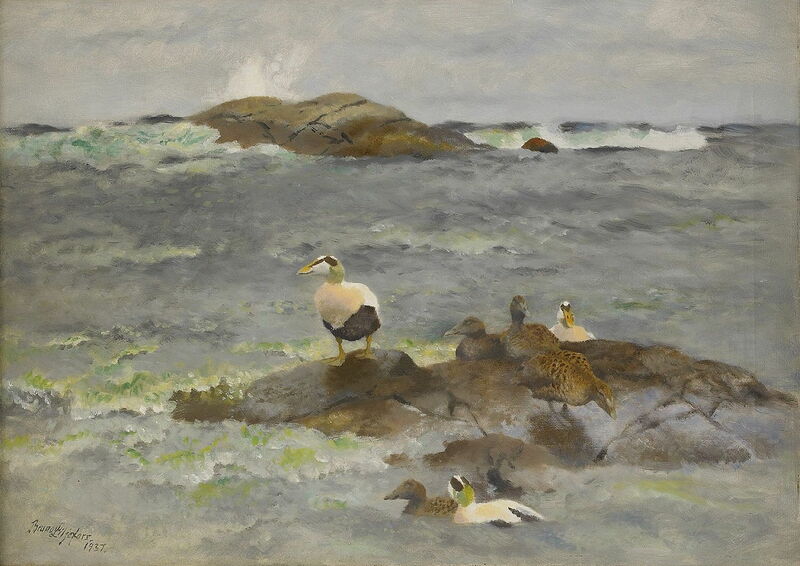 Bruno Liljefors (1860–1939), Eider on the Islet (1937), oil on canvas, 48 × 68 cm, location not known. Wikimedia Commons. Eider on the Islet, painted in 1937, must be one of his last works from the coast. Liljefors was also an accomplished gymnast, acrobat, and variety artist. With his two brothers, he formed the Manzodi Brothers, an acrobatic group who entertained Swedish audiences. He died in Stockholm on 18 December 1939, a few months after the start of the Second World War. 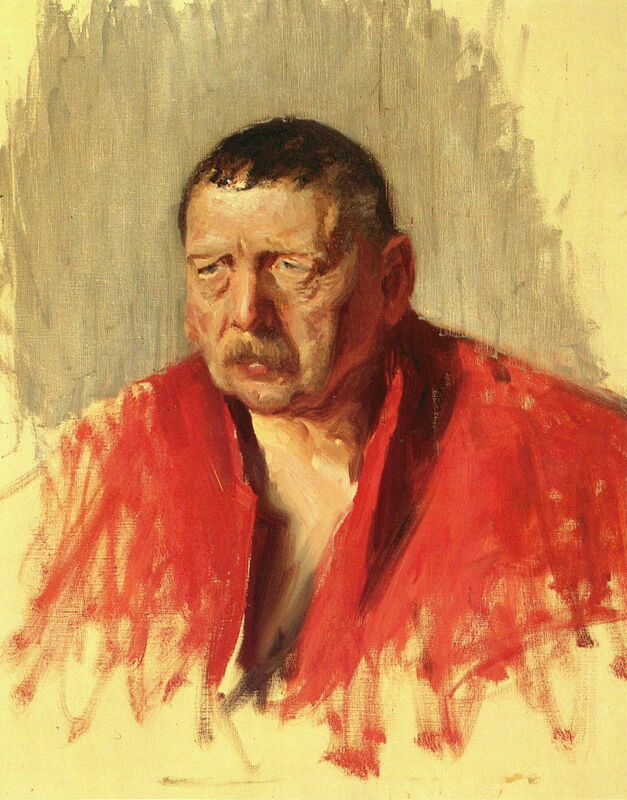 He had outlived Anders Zorn by almost twenty years. Liljefors’ paintings have not, as far as I am aware, been generally recognised as Naturalist, although in 2016 Carl-Johan Olsson of Stockholm’s Nationalmuseum proposed that he was influenced by contemporary French Naturalist art such as the paintings of Bastien-Lepage. Recent accounts of Naturalism don’t include any references to Liljefors’ paintings, nor to the work of other wildlife artists of the time. However, Liljefors’ art blossomed during the heyday of Naturalism. He was apparently influenced by Jules Bastien-Lepage and the art of the colony at Grez-sur-Loing, which was the heart of Naturalism. His paintings are robustly realist throughout, and their subjects are usually rendered in quite fine detail even though his settings are often more painterly. Olsson considers this to be his skilful balancing act in focus, apparent even in his portrait of his future wife Anna, for example. Liljefors’ paintings explore the relationships between different species, particularly that between predator and prey, although he neither falls victim to sentimentality nor does he overdramatize. Indeed, his wildlife paintings are paragons of the objectivity which the late nineteenth century sought, and with which Naturalism was most concerned. Could Liljefors have been a Naturalist painter of nature? Carl-Johan Olsson (2016) Art Bulletin of Nationalmuseum Stockholm, vol. 23, available here. Posted in General, Life, Painting and tagged Bastien-Lepage, landscape, Larsson, natural history, naturalism, nature, painting, Zorn. Bookmark the permalink.